Tom Stewart collected 26 disposals and seven marks against Collingwood in round one. THERE were plenty of unlikely results in round one and there were some unlikely names who starred as well. The biggest surprise of all was undoubtedly Fremantle's Cam McCarthy. Not picked in either of the Dockers' squads for the JLT Community Series, McCarthy came into Freo's side and flourished with five goals to lock in the full-forward spot in our Team of the Week, brought to you by AccorHotels. Port Adelaide pulled off one of the upsets of the weekend and was rewarded with three players. Tom Rockliff looks like he wants to make up for a disappointing 2018, evergreen forward Justin Westhoff starred again and anyone wanting to write off former captain Travis Boak does so at their own peril. A huge reason Geelong upset Collingwood on Friday night was Tom Stewart's performance. Young GWS backman Sam Taylor did plenty of work to nullify Essendon duo Jake Stringer and Shaun McKernan. 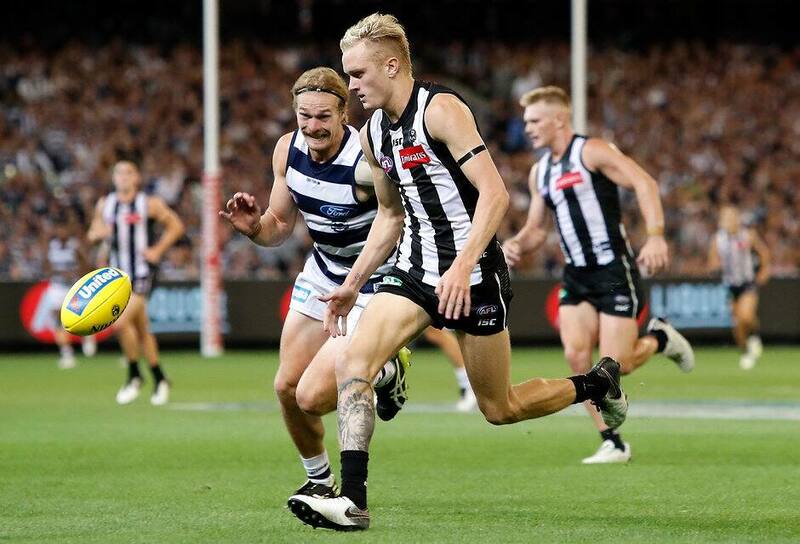 The Pies saw what Darcy Moore can offer after an injury-interrupted 2018, while Hawthorn's James Sicily demanded a spot with an absurd 15 rebound 50s. It was a quiet opening term for Harris Andrews but West Coast had no answer for him after that. Christian Salem was best in a Dees side that struggled and stood up in the third term when his side won the lead back. The Giants dominated Essendon in the contested stakes, with Stephen Coniglio and Tim Taranto running rampant. Rockliff was prolific with 44 disposals while Marcus Bontempelli was back to his best as the Western Bulldogs upset Sydney. Ben McEvoy was the standout ruck and Geelong will be even more desperate to keep Tim Kelly after his best-on-ground display. Boak was relentless at the contest and Westhoff booted five goals. There's no replacement for Tom Mitchell but James Worpel put his hand up as the Hawks beat Adelaide. Richmond had three players kick three goals, one of whom was Jack Higgins. It was astonishing to see McCarthy be so good after only receiving a selection reprieve because of Jesse Hogan's absence. Having Charlie Cameron back from a serious foot injury was pivotal for the Lions – he helped turn the game against West Coast in the second quarter, was always dangerous and booted a goal few others would have been capable of. Every time Hugh McCluggage touched the footy, good things happened for the Lions. Patrick Cripps and Nat Fyfe were typically dominant through the middle, while Trent Cotchin unsurprisingly led the way for Richmond.